Balconies can be a great place to get some sun, but they are also subject to rain, wind and snow. Take measures to protect your balcony from the elements by waterproofing it properly on a regular basis. Balconies are typically open to the elements. They are also not typically used as during snowy months, which means that rain and snow may sit on the balcony flooring for extended amounts of time. 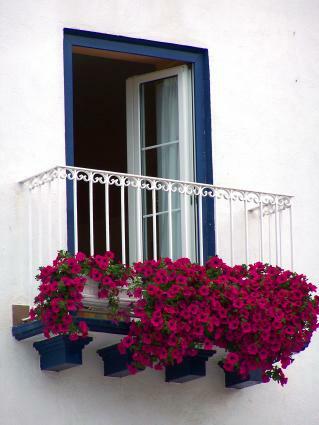 This moisture can lead to staining, rotting, pitting or cracking of the balcony's materials. Waterproofing the balcony helps keep moisture on the surface of the material, rather than allowing it to absorb inside. This in turn helps protect the balcony material from water damage. Keep in mind that each material may have specific needs for the waterproofing sealer. Stone tiles will require an impregnating sealer for example, while wood will require a topical application. Always use the waterproofing substance made for your balcony's materials. Clean your balcony well before undertaking any waterproofing job. Clean off any loose debris and wash the balcony well. If possible, waterproof the balcony during a forecast of several days of good weather, to ensure the barrier has time to dry properly. Take the waterproofing agent outside to the balcony and pour it into the bucket for easy access. Do not open the agent indoors, as many products have high levels of VOC that must be used in well ventilated areas. Dip the paint roller into the waterproofing agent and roll it across the floor, sides and undersides. The balcony will appear wet where the agent has made contact; cover all dry areas. Dip the foam paintbrush into the agent and use it to apply the waterproofing barrier to areas that could not be reached by the roller, such as between and beneath railings, around doorways and between boards. Wait the recommended amount of time and if applicable, buff the remaining agent from the balcony using a soft cloth. Work the cloth in a circular motion to remove excess materials. Allow the balcony to dry completely before using. If yearly or semi-yearly applications of waterproofing agent seem like too much work, consider installing a permanent waterproofing solution for your balcony. Options include placing waterproofing membranes beneath stone or tile floors to help prevent moisture from penetrating below the tiles, as well as sheet vinyl meant to be walked on. Vinyl deck boards and tiles can also be used to help protect your balcony from water damage. Even if your balcony has been waterproofed in the past, remember to reapply on a regular basis. Constant exposure to sun, rain and snow can break down the waterproofing agent, leaving your balcony vulnerable. Check the floor of the balcony often; if water beads up off the surface, the material is still protected. If water appears to be soaking into the balcony, however, it is time to reapply the waterproofing agent.